2. Open My Computer/Windows Explorer. Select Tools> Folder Options. 3. Select the File Types tab and click the New button. 4. 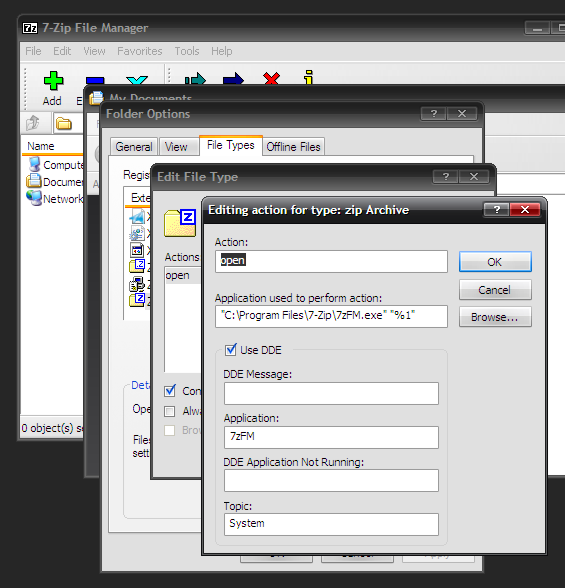 Type zip into the file extension text field and click OK.
5. Select the ZIP extension if not already selected and click change. 6. Click Select the program from a list and click OK.
7. Browse to C:\Program Files\7-Zip\7zFM.exe and click Open. 8. Click OK and zip files will now be opened with 7-zip. 7-zip set as default zip file manager. Excellent ! Has a bit of difference on my comp. at steps 7. & 8. Got it completed o.k. with a bit of trial & err. Thanks !! No it did not. I have downloaded 7-Zip, but it is not showing as a default option, or as an option to even use.